Designed for demanding business people, this new generation of the most emblematic Samsonite business collection comes now even lighter and with more features than its predecessor. With a focus on improved organization and security, while significantly reducing the weight, Pro-DLX4 responds perfectly to the demands of the frequent traveller and business professionals. 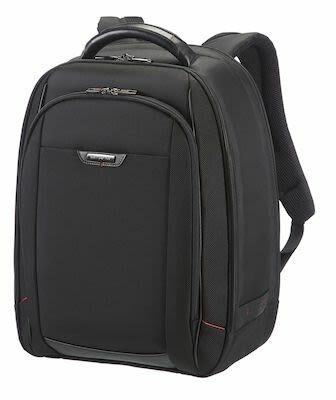 Pro-DLX4: Pure performance PRODUCT INFO- MODEL: Laptop Backpack COLOUR: Black MATERIAL: Armoured Nylon with napa leather accents DIMENSIONS: 48 x 35.5 x 28 cm MAX. LAPTOP SIZE: 37.5 x 26 x 3.5 cm (⌀ 39.6 cm) MAX. TABLET SIZE: 27 x 19 x 1.7 cm (⌀ 25.7 cm) VOLUME: 24 L WEIGHT: 1.3 kg WARRANTY: Limited 2 year global warranty SKU: 79968-1041 DETAILS EXTERIOR MATERIAL INFO: Softside LOCK: Combi padlock with TSA to allow safe travel to the US ZIPPERS: Yes HANDLES: Top handle(s) EXTERIOR POCKETS: 2 front pockets & 2 side pockets SMART SLEEVE: Yes BACKPACK STRAPS: Ergonomic backpack straps BOTTLE HOLDER: Yes BACK COMPARTMENT: Large zipped back compartment. INTERIOR LAPTOP COMPARTMENT: Padded laptop compartment. LAPTOP SCREEN SIZE: 15.6" TABLET POCKET: Padded tablet compartment.